Lama Zopa Rinpoche presiding over long life puja, Kopan Monastery, June 2011. We Welcome a New Resident Geshe! 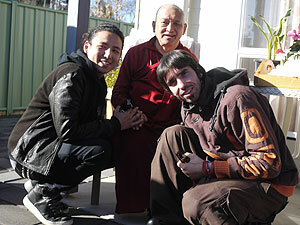 Gomo Tulku, Lama Zopa Rinpoche and Osel meeting in Bendigo, Australia, June 2011. 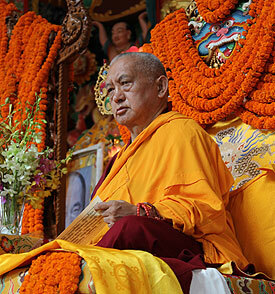 To keep updated on Rinpoche’s health, please go to Rinpoche’s Health – Updates and Practices. It is possible to subscribe to the RSS feed in order to ensure you find out the latest news the minute it’s posted. 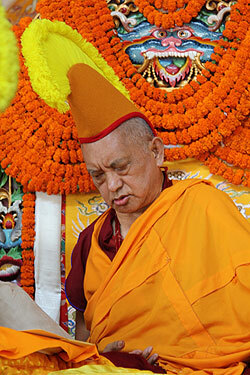 Rinpoche. Serkong Dorje Chang also attended, spontaneously appearing that morning. Lama Lhundrup attended even though he’s not well. Lama Zopa Rinpoche managed to walk down the steps (and there are a lot of steps!) Rinpoche is very determined to walk unaided and he does it fearlessly. If someone is not with him, he can easily stumble as the right leg isn’t stable yet. Rinpoche just heads off whether I am around or not! The long life puja went very well, Rinpoche was very happy. “Dakpa Rinpoche (ex-Abbot of Sera Mey Monastery) will then begin the pujas for Rinpoche; these will go on for several days. The most unbelievable way to collect merit in the West is in the center, where you go to receive Dharma teachings, where there is a resident teacher from whom you take teachings and who you regard as your guru, and where there are students who have the same guru. They are the disciples of one’s own guru. Whether the guru is there at the center or far away, they are disciples of one’s own guru. So if at the center you make offerings to the students [of the same guru], even just offering a glass of water or a glass of whatever is the best beer, if you offer to everybody, can you imagine the merit? Woooow. Can you imagine the merit? Wow, wow, wow, most amazing. Even if you offer to only one student, you create far more merit than making offerings to numberless Buddha, Dharma and Sangha in numberless universes. Offering to all those [is less merit] than offering one glass of water to a student who is the disciple of the same guru as you. At the center, even if you offer to only one person, [you create the] most unimaginable, unimaginable, unimaginable merit. Actually I should add more, I should add on “unimaginable” – many hundreds, even thousands – I should be doing that. Maybe the hours today and tonight are not enough [to do this]. You don’t need to think that to collect merit you have to send [your offerings] far. Just right there, wherever you are, whatever help you are giving to the center – your time, making something, etc. – whatever help you are doing, you are offering to all the guru’s pores, and that is offering to the guru himself – every single thing becomes an offering to the guru. Whatever you do at the center is an offering to all the students, to all the guru’s pores. You should think about this. Can you imagine how much merit you collect? Offering tea, offering food during a puja…. It is not that you have to do puja (you can do it if you want), but just to gather and offer tea, offer snacks, food, a meal. Of course, you can also do some practice, it is more powerful, much more powerful. Whatever you offer, whatever help [you provide] is an offering to the guru. Whatever you do, you have to understand that. Generally, when you make charity, when you do the practice of giving, it looks like [what you’re offering is] going away. You are finishing up your money and it looks like it is going away, but actually, in the Arya Sanghata Sutra, the Buddha explained that making charity of just one hair – just to give an idea – by making charity to somebody with something the size of one of your hairs, giving something so small, from that, 80 … Maybe somebody remembers? You read Sanghata Sutra or Golden Light Sutra? How many times did you read? Ven. Dr. Adrian Gyatso: Five hundred times. Rinpoche: Doctor Adrian read the Arya Sanghata Sutra 500 times. Wow, amazing. That is aaaamazing. Thank you very much. Doctor Adrian, during three years of retreat on Kangaroo Island, read the sutra 500 times as his main preliminary practice. Of course, his main preliminary practice is all those times [when he helped], the many things that Doctor Adrian did. I don’t remember at the moment – there were many people who read Arya Sanghata Sutra a number of times – but the number that Doctor Adrian read [the sutra] is probably the highest number. In the Arya Sanghata Sutra the Buddha says the benefits of making charity to sentient beings of even one hair lasts for 80 eons. Eighty eons, not years, and the result is unbelievable wealth. The result of giving something very tiny, like one hair, one time to somebody [who is a disciple of the same guru as you] is 80 eons of wealth. So to be able to come to the center and either give to students and make offerings to them, or offer to the center itself – your time, finances, whatever – every single thing becomes an offering to the guru and to all the pores of the guru. [It becomes an offering to] everybody who comes to listen to teachings, everybody who comes to meditate there and it is for their use, for their benefit. Basically, the center is for all the sentient beings who come there, to benefit them. So the merit you collect, can you imagine? The merit that you collect is most amazing, most amazing. Excerpted from Rinpoche’s teaching given on April 14, 2011 at the Great Stupa of Universal Compassion, Bendigo, Australia. Typed simultaneously as Rinpoche taught by Ven. Joan Nicell, edited by Claire Isitt and Michael Jolliffe. To watch the video of the full teaching go to the Bodhicaryavatara commentary in the “Special Commentaries” section of the Online Learning Center. In order to facilitate Rinpoche’s recovery from the stroke, the remaining teaching events scheduled in 2011 have been canceled. Lama Zopa Rinpoche with Khen Rinpoche Lama Lhundrup during long life puja for Rinpoche, Kopan Monastery, June 2011. NEW! Lama Zopa Rinpoche’s teachings from the recent Bendigo, Australia retreat are now available on the Online Learning Center (see Bodhicaryavatara commentary in “Special Commentaries”). These fabulous teachings are available in video and audio formats. COMING SOON! Choden Rinpoche and Ven. René Feusi offer five teaching sessions and five meditation sessions from the shiné retreat held at Vajrapani Institute, June 2011. These will be available in video and audio formats on the Online Learning Center (under “Special Commentaries”). Extensive English-language Basic Program materials updates are now available. Several updates of standard text and commentary translations, and several transcripts of oral commentaries from Nalanda Monastery, Amitabha Buddhist Centre and Losang Dragpa Centre, are included. All centers using Basic Program can check the latest list of materials to see clearly what has been updated. The complete Lama Chöpa Jorchö stand-alone text, which includes all Tibetan and scriptural references, is here! 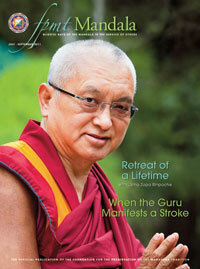 When Lama Zopa Rinpoche received the final draft text in February, Ven. Roger wrote, “Rinpoche is very happy this is done.” Rinpoche then went through the entire text, making final suggestions and comments. These were all incorporated and all the Tibetan checked with grateful thanks to Geshe Nawang Drakpa, Geshe Sherab and Ven. Pemba. To encourage everyone to use this profound and precious text for individual and group practice, and to celebrate its arrival, we are offering free shipping for all orders of 10 or more copies for one month. To receive free shipping orders cannot be combined with other shop orders. On the Lama Chöpa Jorchö product page, you’ll also find a PDF download of three short teachings by Rinpoche on the practice, MP3 audio files of Rinpoche teaching the practice’s tunes, and MP3 files of Ven. Dechen leading the entire practice according to Rinpoche’s advice. We have also made available an e-book file containing just the English and phonetics. How wonderful! How to Offer 1,000 Tsog Offerings: By using the “Extra Tsog Offering Verses” composed by Pabongkha Dechen Nyingpo and translated by Lama Zopa Rinpoche, one can offer tsog 1,000 times (individually or as a group) to purify broken and degenerated vows and samaya, especially with one’s guru. This practice is based on instructions by Lama Zopa Rinpoche. Requires empowerment. Chenrezig Opening the Eye is now available as booklet and e-book formats. A Short Practice of Four-Arm Chenrezig is now available in e-book format. Only limited supplies of the glossy booklet remain! A Short Hayagriva Practice with Lam-rim is now available in booklet and e-book formats. This short practice was compiled by Lama Zopa Rinpoche and combines a Hayagriva visualization with lam-rim meditation. Does not require empowerment. An updated and comprehensive Published Materials Available is always available online. Take a look at what we can offer to support your practice. Please note: all requests and questions regarding education practice materials should now be addressed to Tom Truty: tom@fpmt.org. Sarah Shifferd (formerly, Gyalten Mindrol) will now be focusing exclusively on editing. 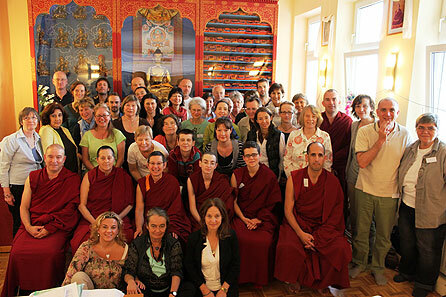 FPMT Translation Services hosted FPMT’s first translation conference at Istituto Lama Tzong Khapa in May. The conference was very successful with many concrete strategies put in place for establishing a glossary of terms for the translations of texts for FPMT study programs. More than 40 people attended, including Yangsi Rinpoche, with Ven. Joan Nicell and Merry Colony facilitating. A full conference report will be made available in late June. Stupa of Universal Compassion. Plus, you’ll always find our regular updates and features that bring you the exciting and inspiring news of FPMT centers, projects and services around the world. Mandala’s July-September 2011 issue is already in the mail. If you don’t currently receive it, please consider becoming a Friend of FPMT. Also, don’t miss Mandala‘s exclusive online content! Work a Day for Rinpoche celebrated Saka Dawa on June 15 with a flood of kindness from all parts of the world, from people inspired to dedicate a day or more of their wages to help actualize Lama Zopa Rinpoche’s vision for the organization. We offer our heartfelt thanks to all of the “workers” around the world for your kindness and service in all its forms, you truly make a difference. Please join us on Facebook to share your inspiration and rejoice. Nos complace informaros de que ya tenéis disponible en español el Manual de la FPMT versión mayo 2011, puesto al día con los últimos cambios. Lo podéis descargar desde la web de la FPMT y desde el Área de centros de la web de la FPMT-Hispana: donde también tenéis disponible. Over 40 directors, SPCs, coordinators and board members were warmly hosted by Panchen Losang Chogyen Centre in Vienna, Austria for a very successful regional meeting, May 28-29. Participants at the European Regional Meeting, May 2011. Geshe Jampa Tharchin has arrived to teach at Chandrakirti Centre, New Zealand. If you are interested in training to become a Tibetan-language interpreter in order to offer service in an FPMT center, LRZTP 6 is for you! The program is scheduled to begin March 15, 2012. More information and an application form are available online. Buddha House, Australia is looking for a qualified resident teacher; Der Diamant Verlag sucht Mitarbeiter/in; Land of Calm Abiding is looking for resident caretakers.